Home / Euskadi / #Squat #Euskadi: Let’s Defend #Errekaleor! Note: Enough is Enough and Riot Turtle are not organizing any of these events, we are publishing this text for people across the US and Europe so they are able to read what is going on and for documentation only. Yesterday the City Council of Vitoria assured that it will implement the “recommendation” of the General Secretariat of the Plenary to establish public lighting in the ‘squatter’ district of Errekaleor again, but has also stated that it will also take into account the “safety” motives that motivated the cut of the electricity. The city council ordered to cut off electricity in the first place and city authorities declared once again that they have every intention to evict the squats in Errekaleor. 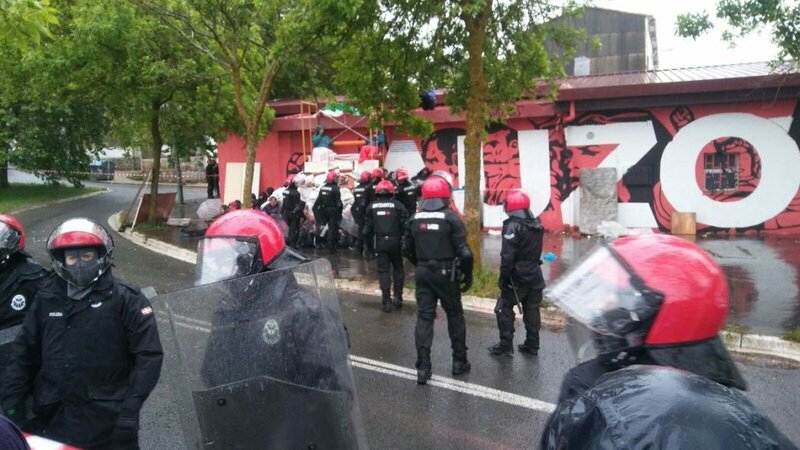 Riot cops protecting employees of the electricity company Iberdrola, who came to cut of electricity to the squatted Errekaleor neighbourhood in Gasteiz on May 18th. The first building in the Errekaleor neighbourhood was squatted at the third of September 2013. In the years that followed all buildings in Errekaleor were squatted, a neighbourhood just outside the city of Gasteiz. Now 150 people are living in the squats. Together with La Esperanza at Gran Canaria, Errekaleor is one of the biggest occupied spaces in Spain and the biggest in Basque country. The houses in the neighbourhood were build in the 1950’s for migrants from the south of Spain who worked in the factories in the north. In the beginning of the 1980s the neighbourhood was slowly abandoned, due to the poor quality of the houses, the distance from the city center and declining industrial employment. After the collapse of the real-estate market in 2008, the city government of Gasteiz had no money to do anything with the buildings in the Errekaleor neighbourhood. After the buildings were squatted Errekaleor becomes a self-managed, autonomous neighbourhood, declaredly anti-capitalist, and from that moment on known as Errekaleor Bizirik! (Errekaleor Alive!) It all started as a centre for university students of the Basque Autonomous Region (Euskadi) and established ties between the student movement of Gasteiz and the broader society. Many families, victims of evictions due to the collapse of the real-estate market, were housed and some of the former residents returned. In February 2014 a first attempt by city authorities to evict the squatted neighbourhood failed due to the resistance of many groups in the city. The attempt only made the squatters stronger. The projects in Errekaleor started to attract people from all over Basque country. The squatters created a school, a bakery, a cinema and planted crops and other projects. On the third of June people will take the streets to make clear they will defend Errekaleor against any eviction attempt. The demo will start at 05:30pm at la Plaza de la Virgen Blanca in Gasteiz (Vitoria).